12:37 PM, Thursday, February 19, 2015 (EST) in New York, USA. When an up trend or a down trend is reversed, a trader should first see whether the trend reached the 38.2% Fibonacci retracement level or not. I always keep close look on the 38.3% retracement level when the trend is reversed. In this post I am going to write about the way to trade with 38.2% Fibonacci retracement level when the price reaches to it just after a reversal. We know that the Fibonacci retracement levels represent strong support or resistance levels. When a bullish trend is reversed, a 38.2% Fibonacci retracement represents strong support, and when a bearish trend is reversed, a 38.2% Fibonacci retracement represents strong resistance. Here in this post, I am only focusing on the situations when the trend first reach the 38.2% Fibonacci retracement level after a reversal. Followings are some of the situations explained with price charts. 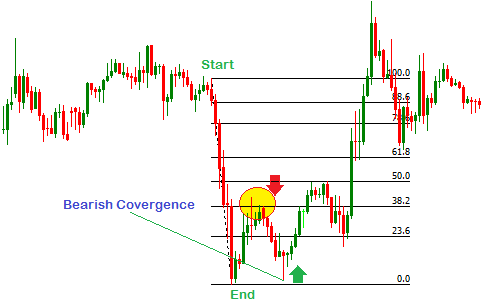 In the above price chart, we can see a situation when price reaches to 38.2% Fibonacci retracement level after a reversal of a bearish trend, and the price is pulled back to the 0% Fibonacci retracement level. In the above price chart, a bullish trend is reversed and is reached to 38.2% Fibonacci retracement level and pushed back to almost 0% Fibonacci retracement level. Similar to the above situations, I found so many situations where the price reached to a 38.2% Fibonacci retracement level. The interpretation of my study are as follows. When the price reaches to 38.2% Fibonacci retracement level just after a reversal, in maximum cases price does not be able to break the 38.2% Fibonacci retracement level. I found this principle was effective when the difference between the start and end point of the Fibonacci retracement tool was 70-100 pips or larger on 30m chart and 120pips or larger on the charts larger than 4hr time frame. The technique can be effectively applied on 30m, 1hr, 4hr and 1d charts, but can not be effective on smaller time frame charts. When the price reaches to 0% retracement level after pulled back or pushed back, a bearish convergence or a bullish divergence is very common to be appeared. 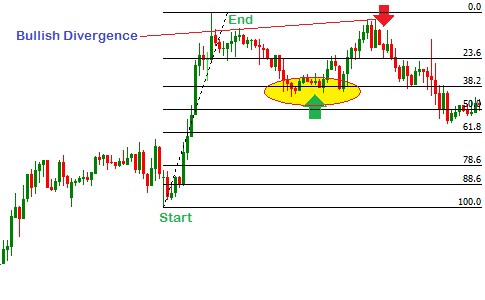 A buy/sell order can be placed when the price reaches to a 38.2% retracement level just after a reversal. A buy/sell order can be placed when the price makes a bullish divergence or a bearish convergence at 0% Fibonacci retracement level. Breakouts traders should not place a buy or a sell order when the price breaks the 38.2% Fibonacci retracement level just after a reversal. The stop loss for the orders should be placed little upper or lower of the next Fibonacci retracement level. How to measure the probability of 38.2% fibonacci retracement level breakouts. Dear traders, these are the interpretations of my study on 100 of cases where the price reaches to a 38.2% Fibonacci retracement level just after a reversal. I hope my interpretation will help you to enrich your forex trading. If you have any question, you can drop a comment below.